This year I started teaching a new version of a course: a second-year extensive reading-based class. 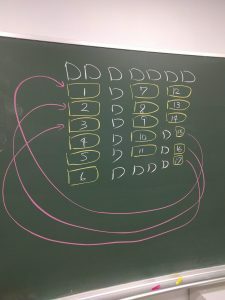 The class is an elective compulsory class (so the students have to take it, but they can choose which teacher to take it with, and the teachers have free rein to determine the content of the class). The new version consists of 35 minutes of silent reading (students can also work on their preparation sheet for speaking during this time) followed by about 35 minutes of speaking and ten minutes of writing. During the speaking part students talk to each other about a book they read this week. They have a preparation sheet where they have already written about their book which they can use to help them. 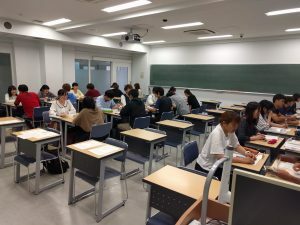 My colleague Dan E. suggested I try the ‘speed dating’ format for this, and we ended up with students working in pairs for five minutes, then changing partner and repeating. We usually manage about five iterations. Students can use their preparation sheets the first couple of times, but should try not to after that. The key to this is to spend as little time as possible making pairs and moving, in order to maximise student talking time. The easiest way I know to do this is to create a map of the classroom on the board (see picture above). The white squares are desks. The yellow rectangles are two desks pushed together. I number the students, then they move to their initial pair and do the first iteration of speaking. Then I ask the students facing the window to stand up and move 2-3 spaces up to a new partner. Repeat as many times as you want to (although be aware of when students are going to cycle back to the initial point). This works very well for pairs, but I had 31 students today. Thankfully I found an easy solution. I made a group of three with the extra person, but (this is the key) all three of them were ‘facing the window’. 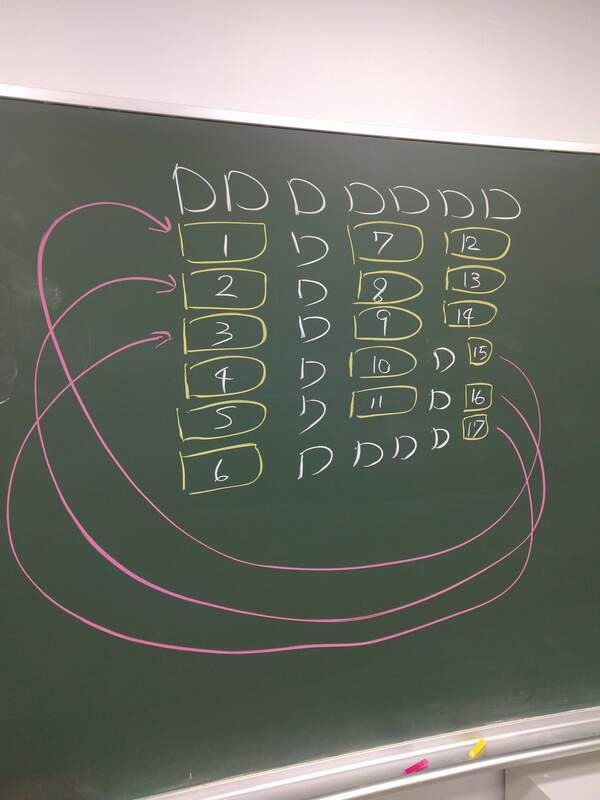 This, combined with having students move up three spaces each time they changed, meant that no one student was stuck in the 3-group more than once. In fact, the students seemed to enjoy the 3-group for the novelty, so it worked out really well. Rotations are great for giving students practice with the same language, different partners. I often join the rotation if I have an odd number. They don’t really need supervision, but sometimes they call out for me to give some support. I seem to be able to give it and still participate in the rotation – Probably because I can use language more efficiently than the students.